Multi-way pot after attempted steal from the CO. Cbetting in to multiple players on the flop and double barreling the turn. Playing in position against a short stack who donks the flop. Calling a raise with a suited connector. Hit an open-ended straight draw on the flop. Bluffing a 4-flush card on the river. A Collection of Postflop Air. You've raised preflop with good position and a pretty hand. The flop comes and you've completely missed it (standard). What do you do? Here are six hand histories and six discussions about it. Bluffing without any showdown value. 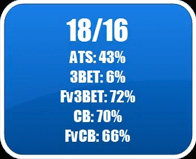 How bet sizes affect ranges. This is a more theoretical vid than usual, so be prepared. Finish off whatever you're eating and close out those other tabs before you start watching. 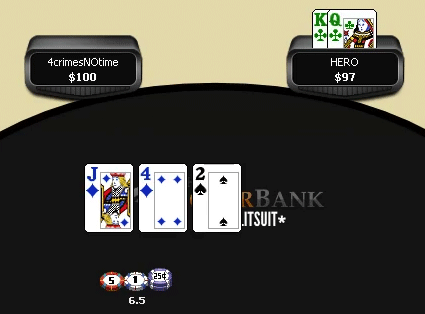 Hand 5 - Nailing the flop with KQ. "Always consider your opponent's reactions to each of your actions"
"As you move higher and higher, less plays become 'one and done'"
"If you see a showdown, take a note of some sort." "Remember that range reading is linear and logical."